CDR OxiTester, the analytical system for vegetable oils and fats, was used to perform Peroxide Value testing and Free Fatty Acids testing during the study entitled “Qualitative Changes of Olive Oils Obtained from Fruits Damaged by Bactrocera oleae (Rossi)“, made by Riccardo Gucci, Giovanni Caruso, Angelo Canale, Augusto Loni, and Alfio Raspi Department Coltivazione e Difesa delle Specie Legnose ‘‘G. Scaramuzzi,’’ University of Pisa, 56124 Pisa, Italy Stefania Urbani, Agnese Taticchi, Sonia Esposto, and Maurizio Servili Department Scienze Economico-Estimative e degli Alimenti, University of Perugia, 06126 Perugia, Italy. Mature fruits of Olea europaea L. ‘Frantoio’ with different degrees of damage caused by the olive fruit fly (Bactrocera oleae) were sampled to quantify the effects on free acidity, peroxide value (PV), and concentrations of secoiridoids and lignans of virgin olive oil (VOO). The relationship between free acidity (A) or peroxide value (B) measured according to the Official method (EU 1989/2003 modifying the ECC 256/91) and the CDR OxiTester. (A) y=1.06x + 0.001, R2 =0.996; (B) y=1.09x – 0.21, R2 =0.995. 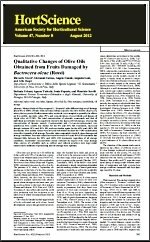 Peroxide Value and Free Fatty Acids analysis of Olive Oils Obtained from Fruits Damaged by fly was last modified: April 12th, 2019 by CDR s.r.l.